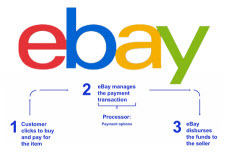 eBay is again actively recruiting sellers to sign up for its managed payments. Based on our observations, eBay eased up on the marketing efforts during the busiest part of the holiday shopping season (let us know if that was your experience). On Monday, eBay sent out an email to some sellers inviting them to "Join other sellers and register today" for its managed payments offering, and it heavily featured Apple Pay as a benefit to sellers. While shoppers can use Apple Pay when purchasing through managed payments (on mobile devices only), a major sticking point for sellers is the exclusion of PayPal as a payment method. eBay has said it expects to add PayPal as an option to its payments program this summer - but buyers will use eBay's PayPal account, not the accounts of individual sellers. During last week's post-earnings call with Wall Street analysts, eBay CEO Devin Wenig said that eBay had enabled $140 million of GMV with over 3,500 sellers active in the program since late Q3. Let Your Business Be Your Focus: Reap the rewards. Check out the benefits that other sellers are already enjoying with managed payments. - Offer a New Way to Pay: Accepting Apple Pay gives your buyers a new way to pay. - Simplify Operations: Manage fees, get personalized support, and resolve disputes all in one place. Receive automatic payments directly to your bank account. - Reinvest Your Savings: Save up to 25% on payment processing fees that you can invest back into your business. Ina its not April 1st. Ebay is joking right. eBay could ask me 10 times a day from now UNTIL DEATH and I would never ACT to sign up to be a FLESH AND BLOOD CRASH TEST DUMMY -for this ill-conceived Managed Payments Fiasco in the Making just because DEVIN wants to thumb his nose at PayPal. Ebay is NOT trying to entice sellers to embrace a CHISELED IN STONE Tried-and-Tested final version of this fiasco. Read the message and let it sink in that they are still trying to sell folks on TRYING OUT the Warts and All "BETA TEST" version. Who is DENSE enough to be misled by "...Save up to 25% on payment processing fees that you can invest back into your business..."
Yeah, right. AS IF the payment processing fee CURRENTLY thru PayPal were some MASSIVE Percentage. Nibble off 25 "percent" of 2.9 percent and the savings would be PIFFLE. LESS than piffle when one considers that "up to 25 percent" means that MOST would NOT see even that PIFFLE 25 percent savings. Dollars to Doughnuts even the BEST that eBay might be offering here will SURELY be CLAWED BACK by the second or third Seasonal Rules Change. Give me back a percent or 2 back and I'll think about it. The marketing email is a clear sign that the sellers aren't signing up by the thousands to try out Devin's Folly. He must be getting nervous that he can't get enough lab rats, I mean recruits, to embrace his latest scheme the way he thought he would. I would NEVER sign up for ANYTHING recommended by ebay. ESPECIALLY if ebay did the programming. Do not ever trust anything ebay wants you to try, always wait until they force you. If it was good, other sellers would not be running from it and opting out. If it was good, no one would have to beg you to try it. NEVER trust ebay. I'm also not liking the fact that when PayPal is added, buyers will use eBay's PayPal account, not mine. We got along without PayPal for a thousand years. What catches my eye on this entire thing is that EVEN when ebay allows sellers in the Managed Payment Program to accept Paypal, it will be Ebays Paypal account not the sellers. This means that Ebay is going to make additional money on that float also as the Sellers will no longer get the instant payment like we are used to through Paypal, but it will once again be coming from Ebays account which means we have to trust them even more to do correctly calculate what we are owed, plus wait another 3-4 days to get the money from Paypal. Also when there is a chargeback through Paypal you better believe that Ebay is not going to bother spending the time and money to fight it and will just take the money from the sellers account and move on as they cannot afford the staffing necessary to deal with this. This is why Ebay was not ready for Paypal when they threw this program out at the sellers. They have to create their account and negotiate a better rate with Paypal (ROFLMAO) so they can squeeze another few pennies out of each transaction, even when its paypal. They also have to try and design the programming to allow for this to happen automatically and cannot depend on Adyen for help nor Paypal. So its all going to be up to those great programmers from India who are designed and implemented Sellers Hub and the Out of this World Catalog. So now Sellers will pay the Paypal discount rate but instead of getting instant access to their money, it will go to Ebay who will then decide to disburse it when they feel like it which could be daily, weekly or even monthly. But this has a double edge sword that I am sure Ebay is not counting on Sellers realizing. Once Ebay has a Paypal account they can actually then disburse all revenues to the Sellers Paypal account instead of forcing them to give banking information to Ebay. I have other sites that collect all of the money and then distribute it to the sellers straight to their Paypal Accounts with no issues every month. How much does anybody want to bet that Ebay refuses to use this option since they will lose the extra money on the float that Wenig is counting on?? Was Devin Wenig born this stupid or did he have to practice hard? "Subject: You manage your business, we will manage your payments"
I'll manage my business AND I will manage my payments, thank you very much! I rather think that managing my payments is part of managing my business. Does it not seem reasonable that managing one's own business also INCLUDES managing one's own payments? Probably a moot point though, given the ham-handed overreaching tentacles eBay has injected into managing everybody's business anyway. Which is, by their own definition as ''only a venue'' (when it suits them), NONE of their busness to begin with. Set all that aside even - and consider this - if this, or any other eBay 'program' was so beneficial, why would there even be a need to cajole, coerce, eventually compel, participation? eBay has become a parody of the two-bit broken down carnival barker - come one, come all! And to the ''noise'' - go away kid, yer bothering me. Using "eBays Paypal account" is a slimy underhanded way of saying FU to sellers and Paypal. Paypal isnt the "good guy" here either. Helping eBay pull off this scheme just so they can keep eBay business is underhanded and sneaky. Until Im forced into this - Im out ! You can NEVER EVER trust eBay - EVER. "Ebays Paypal account not the sellers"
So if it is eBay's PayPal account and not the sellers', will eBay totally own the outcome of a sale, for good or bad? Let eBay resell the returned items or deal with some of the outrageous high-drama customers. One wonders what deal eBay have cut with PayPal for an additional money grab. Said by the man in black with greased back hair and no thumbs. eBay has to create a lot of new goodwill before many will trust them on this. Too many burned and still smoldering bridges. Yeah. Will be a cold day in Hades when I ever agree to this schtick. When the inevitable force feed happens, I will move more stuff to Etsy and Mercari. "Subject: You manage your business....."
Forced best offer, forced returns, forced ads on your listings, Forced stock picture. Limits on shipping charge for some items, forced listing take downs from fake Vero complaints, restrictions from selling legal items. A micro-managing parasite in every single crevice of our business. I don't know what's more ludicrous. Managed payments or this farce of a "Subject." eBay needs to increase revenue - and they will do it in ANY fashion they see fit - whether sellers like it or not. THAT describes your "so called business partner" - one who's "of course" ONLY looking out for your ... I mean THEIR best interests. The postal increase (so they can make FVF on shipping prices) couldnt have come at a better time for them !